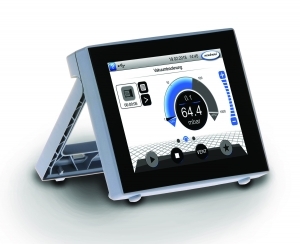 The new VACUU·SELECT® controller brings a modern, touch-screen interface to lab vacuum applications. Scientists find the controller easy-to-use with intuitive navigation, much like their smartphones. Since the VACUU·SELECT® controller comes preloaded with common laboratory vacuum applications, users are able to get started in a matter of moments. To begin work using a rotary evaporator or doing distillation, the user simply selects the Automatic Evaporation process in the application menu and taps the start icon. The boiling point of the solvent is automatically detected and the controller adjusts the motor speed of the pump to maintain stable vacuum. Many other applications such as filtration and drying are also preloaded to allow for a quick start. The VACUU·SELECT® controller makes customizing vacuum applications simple, giving scientists better management over their processes. The parameters for each application are easily modified during the initial setup and can even be adjusted while the process is running. Adjusting the set pressure, process duration and motor speed helps to fine-tune vacuum and flow resulting in greater precision. The VACUU·SELECT controller has an intuitive drag-and-drop editor. This feature allows the user to create their own custom applications in a matter of minutes. To create the process, use preloaded selections as a base or build the application from scratch. In addition to process customization, the user can connect peripheral components, monitor hours of operation, view pressure curves and other activities. Discover for yourself how the VACUU·SELECT® controller helps you do science. If you’d like to discuss how VACUUBRAND’s new controller might help to improve your process, please contact us.